Our office is proud to present an in office dental savings plan to our patients. Bennardo Benefits Membership Savings Program is a program is designed to help individuals get the quality care they deserve for a percentage off of the usual and customary fees. This savings plan has no claim forms, no deductibles, no annual maximums and no waiting periods. Bennardo Benefits is not a licensed insurance company, health maintenance organization, or other underwrite of health services. If you have any questions regarding this program please feel free to contact our office. . In order to enroll, please fill out an enrollment form, select a plan, and fax, email, or mail it to our office. All cash and checks must be mailed or hand delivered to our office. Enrollment will not begin until payment is made in full. This plan is only good at Anthony R. Bennardo DDS PC and does not transfer to any other locations or physicians. This discount is not offered for a referral doctor or specialist. Referrals and specialists will be at Dr. Bennardo's discretion. To be an independent member you must be 18 years or older. Adult premiums apply to patients 13 years and older and children premiums apply to patients 12 years and younger. This plan may not be included with any other offers, discounts, insurance, or other marketing advertisements. Once signed up for the plan, you will receive the benefits for 12 consecutive months. New contracts will be available 30 days prior to expiration. In order to continue as a member for this program a new enrollment form will be required. You have the right to cancel this plan at any time by writing a cancellation request however this plan is non-refundable. This plan is non-transferrable. It may not be transferred to any other family member. Due to the substantial discounts offered with this program, all membership fees and treatment payments are due at the time of service to receive the discount. Any services not paid for on the date of service will be billed out at the regular fees. When multiple visits are required (custom shading, bridges and dentures) a minimum of 75% of the total fees must be paid at the time of the first visit. No refunds will be given if a spouse or dependent does not use the plan, moves, or obtains dental insurance. 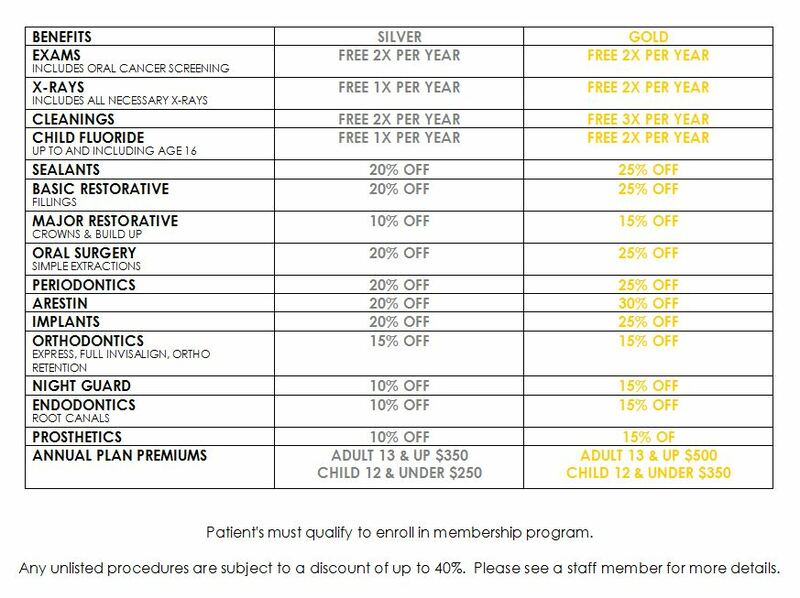 Treatment completed prior to membership does not qualify for discount. Dental products are not included in this discount, including but not limited to Sonicare toothbrushes, Waterpik water flossers, ZOOM! whitening etc. Prescriptions are not included in this program. Two no-shows or cancellations with no 48 hour notice will result in cancellation of your membership without refund. A $50 fee will be charged for broken, cancelled, or no show appointments without 48 hours notice. Anthony R. Bennardo DDS reserves the right to change, update, or cancel this plan or membership to any member at any time. Any changes or updates will be effective at the renewal date for an existing plan member. This update is effective October 2015.